InvisibleBrowsing VPN (IBVPN) provides a professional business VPN that offers a free two day trial so business users can fully check out the service prior to signing up for a payment plan. 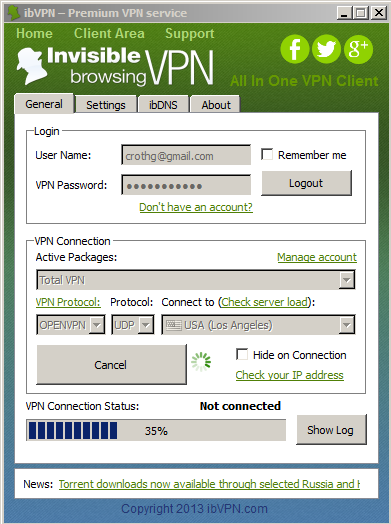 IBVPN offer up to 20 simultaneous connections with their small business VPN plans, though customers requiring access for greater connections can contact the company to discuss a customized VPN package. Business users can sign up for any period of time between one month and a year, although discounted rates are offered for customers who sign up for longer periods of time. With almost 100 different servers located in 35 countries across the world, IBVPN does offer a worldwide VPN service that cannot be beaten by many providers and their live chat support service gives reassurance that problems can be addressed immediately, if they should occur. Invisible Browsing VPN has Servers in the following locations: Sweden, Romania, Germany, Bulgaria, Singapore, Japan, Luxembourg, Italy, Switzerland, Canada, Ireland, Iceland, India, Austria, United States, Hong Kong, Australia, Czech, Norway, France, Egypt, Finland, New Zealand, Panama, Saudi Arabia., Hungary, Belgium, Netherlands, Russia, United Kingdom, Spain, Turkey, Poland. 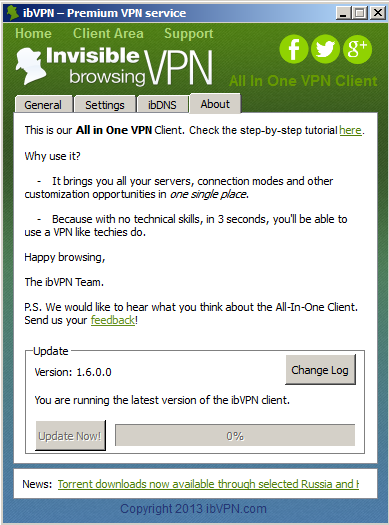 The IBVPN service supports all the popular protocols and the company website provides a number of tutorials and apps that can be downloaded to employee devices to ensure the service is operational on mobile devices and laptops. Users can download details and apps for Windows, Mac, Android or iOS and IBVPN also provide manual setup tutorials for other devices. Where any business values the security of Internet transmissions signing up with IBVPN gives the guaranteed access that is needed by modern employers. Where employees travel around the world on business adding a VPN provides a layer of security that enables free and unrestricted use of the Internet from any worldwide locations. Many countries operate censorship or blocking of some websites and services, with VPN operational any employee can bypass these annoying restrictions and work at normal levels. What’s more employees will have the ability to work while mobile as the security and encryption of the VPN tunnel provides all the necessary reassurance that eavesdroppers or hackers will be unable to access transmissions at any time. IBVPN has worked in the Internet anonymity business since early 2003, so business users can be assured this company knows what it is doing and where it is going. The company has been providing VPN services since 2010 and offers all the features consumers would expect of major players within the Internet security market. Where any business wishes to ensure employee privacy on the Internet, the IVPN service does just that. Many business users need to conduct market research and don’t want competitors or other organizations to know the originating IP address of the researcher, when the VPN is active the chosen server allocates an anonymous IP address to ensure this is the case. Employees working overseas and travelling on a frequent basis will find that logging in via the VPN ensures that geo restrictions applied in various locations can be bypassed. Popular websites and Internet services will always be available to employees working overseas when IBVPN is active, ensuring that the working day is continually productive. What’s more, opportunities for third party eavesdropping and hacking are eliminated at all times when the VPN is active. Where employees need to access the Internet while travelling or mobile, the IBVPN securely encrypted tunnel means that all data transmissions and receipts are protected from hacking at all times. This is a valuable incentive for any business with employees needing to access the Internet from Wifi hotspots which are notoriously insecure. 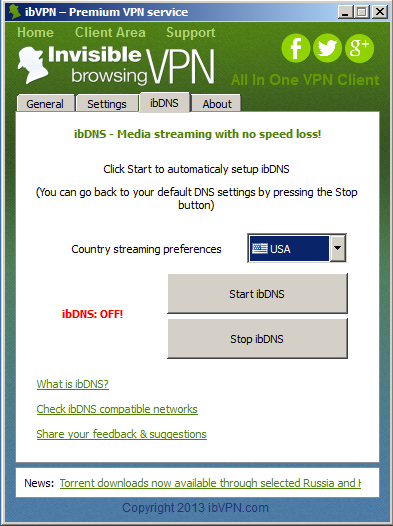 Signing up for VPN services with IBVPN offers consumers the opportunity to try out the service before buying a plan, so it gives any business user confidence that this service will do what it says. What’s more the money back guarantee offered by IBVPN is one more great feature encouraging professionals to trust this company.